Pub in Whitechapel, round the back of the Royal London Hospital. 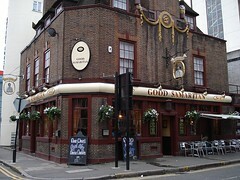 Note: According to the Dec 2016/Jan 2017 London Drinker, the Good Samaritan closed in May 2016 but reopened later the same year. We haven't visited since, so some of the details below may be out of date. An RGL posse visited on a Sunday lunchtime in November 2007 as part of the East London Line pub crawl. There are four handpulls, with beers on offer being Courage Directors and Theakstons Best Bitter. These appear to be regulars as they were the same on a subsequent December 2008 visit (£2.70/pint). There was music on (80s pop), but not too loud (though on other occasions it has been notably louder). A flatscreen TV was showing sport with the sound off (though on the December 2008 visit a football match was being watched with some vocal support down one end of the bar). There is a real fire in the fireplace round the side of the bar! There's also some outdoor seating, some of it covered. They have a quiz machine, and what looks like it might be a jukebox ("Digi Tracks") on the wall round the side of the bar. Sunday roast plus normal menu is served noon-3:45pm Sundays, though not sure about other food times. The Sunday roast was advertised as coming with "crunchy vegetables, sage-onion stuffing, roast potatoes, Yorkshire pudding, and gravy". Confusingly, it was advertised at £6 on the menu and £7 on the blackboards (as of Nov 2007). The normal menu is fairly standard pub food, nothing exciting. Main courses cost between £4.50 (e.g. ham, egg, and chips; meat or vegetable lasagne) and £5 (e.g. omelette with a choice of fillings plus chips and salad; beef, chicken, veggie, or cheese burger; steak, chips and salad; cod, chips and salad). Nachos are £5, chips are £1; chips with cheese are £2; sandwiches (e.g. cheese; tuna mayo; bacon) are £4.50; filled jacket potatoes are £4.50. Kake tried the vegetable lasagne (£4.50), and was pleased to note that it contained actual vegetables (mainly courgettes) rather than fake meat. It was pretty good, and worth the price. The portion of chips that came with it was generous, and the chips were competent enough. doop had the vegetarian burger, which was "OK, and at least not full of peas". Bob's scampi and chips (£5) were "not bad". Note that although it's not obvious on some maps, Turner Street extends right the way up through the hospital to Whitechapel Road, so you don't actually have to walk all the way around to get here. Last visited by Ewan, Kat and others, December 2008. Sunday food times confirmed by phone, October 2007. Food prices taken from menu and blackboards in pub, November 2007. Last edited 2016-12-03 15:54:24 (version 12; diff). List all versions. Page last edited 2016-12-03 15:54:24 (version 12).